So – I took here name and went to the NCBI Blast page and did some searches. And what came up? Well, here are some of the top hits from the blastp searches (which I used to compare the pretend peptide “SARAHPALIN” with all the peptides in the non redundant collection at Genbank). Of course, anybody who has heard me blather on and on about evolution knows that I am always talking about how blast top hits are not a good measure of relatedness per se (see my NAR paper where I first talked about this in 1995). So – I decided to build a tree of Sarah Palin. I used the NCBI Distance Tree option which you can do from blast searches. Since most likely you cannot see that in enough detail – here is a zoom in. So in conclusion – by similarity – SarahPalin is closest to a plant pathogen with an unusual name. And by phylogeny SarahPalin is ancestral to a parasitic nematode. Sounds about right. 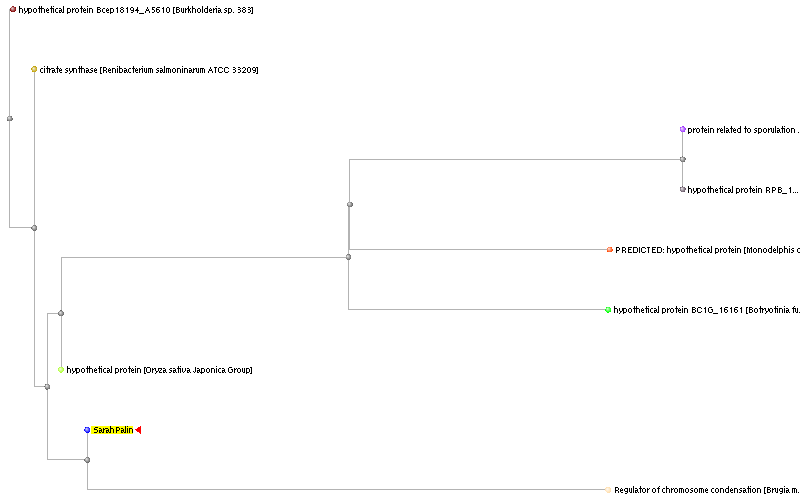 Wait wait wait!In Parabacterioides merdae, the species name ‘merdae’ came from the french word ‘merde’, which is… crap (basically, the place in which you find this bacteria…)Sequence alignment is so powerful! Clearly we can not vote into office someone who may have the power to regulate chromosomal condensation. Especially when she is already under investigation for abuse of power. I can’t believe I missed that. She IS condescending. When I was a PhD student, my advisor was to speak of her work at a meeting of Israeli and Palestinian scientists & students. As the audience was very broad, the talks were to be very non-specific. So what's a bioinformatics lab to do? We decided it would be fun to look for PEACE in SwissProt. The top hit was… wait for it… the receptor for sperm coat protein in the human zona pellucida. The zona pellucida is the outer membrane of the oocyte.Make love, not war! Priceless!!! I think this should become standard practice for anyone standing for office. In fact, lets propose that anyone with non-standard names come up with an appropriate spelling of their choice so that such an analysis can be performed. I have to admit I sat in my chair and sniggered for half and hour after reading this. I then linked anyone I knew who was online at the time…no one else got it. Botryotinia fuckeliana (Botrytis cinerea) is a spoilage agent for wine grapes and also purposely encouraged to generate the Noble rot in the production of grapes for Sauterne style wines. Given her political orientation I can’t figure out if this revelation means she is inherently for, or against, alcohol consumption. Maybe she’s a pit bull with lipstick who likes dessert wines. *sigh* I can’t wait to see the McCain attack ad about liberal anti-palin bias in evolutionists that comes from this post. Trying to just report the facts here Shawna (with a little commentary here and there). If I could have searched using Obama I would have but he has letters in his full name that I could not use. Good stuff, I agree, and quite funny. I do have to point out though that Sarah Palin, being an extant organism, is not “ancestral” to Brugia malayi. Instead, Sarah Palin and Brugia malayi descended from a common ancestor. I only point this out because we should get our evolutionary biology correct, and because it is perhaps even funnier. I wonder what the common ancestor looked like? Finally Mark. Finally someone saw that. I put that there on purpose hoping that some other bloggers would call me to task on it. But alas everyone kept focusing on “fuckeliana”. Imagine that. Yes, indeed, as a modern organism SARAHPALIN cannot be ancestral to other modern organisms. I would hardly call her a modern organism.